This time it’s all about the bees! From the composition of a working hive to the diseases that plague honey bees, plant pathologist Steve Savage delves into the basics of bees. A world-famous expert on bees once said, “you can never tell with bees.” That was none other than Winnie the Pooh. Okay, so he is just a fictional character who really likes honey, but there is a grain of truth in what he said that is relevant today. Over the last 14 or so years there have been many dramatic warnings of a pending “bee apocalypse” that will threaten a significant part of the human food supply. Although this apocalypse has not materialized, and bee populations are healthy in many regions, that does not mean it isn’t a topic of importance. Back in 2006, there was a phenomenon known as “colony collapse disorder,” in which many hives of bees mysteriously failed to survive through the winter. Much of the blame in the media and among activists focused on a particular class of widely used agricultural insecticides called neonicotinoids, or “neonics” for short. While this misguided focus is considered sensational “news” and great for the fundraising efforts of environmental groups, it’s really not that simple and it’s why I like to cite Pooh’s acknowledgment of some uncertainty and complexity when it comes to bees. In a future PopAgriculture episode, I’ll get into the question of whether certain insecticides are or are not threatening a “bee apocalypse,” but on this episode I want to get into the basics on bees because they are an interesting component of the human food production system. Now, as humans we really enjoy the phenomenon of flowers with the huge range of diversity among the many species of plants that make flowers and their various, distinctive scents. These flowers are all part of a prehistoric business deal between plants and various animals that play the role of pollinators. These pollinators regularly mix and match the plant’s genes so that they can evolve and adapt to changes in climate or pest threats as needed. Pollen is the male contribution to a plant’s mating process, and pollinators are organisms that help spread it around to the female parts of flowers called “pistils.” Not all plants need help with their mating. In fact, some of the most widely grown crops cultivated by humans don’t need any help (Wheat, corn, soybeans, and grapes would be examples of self-pollinating crops that just need a little wind to move their pollen around). Those plants, however, don’t always get as much genetic mixing as those that employ the outside help. For the crops that do need pollination help, honey bees are the most familiar actors. There are others involved like bumble bees, as well as bats and birds who are also important for pollination of certain plant species. Anyway, it is a good business transaction between the pollinators and the plants that need them. The plant gets the genetic mixing and the pollinator gets a sugary energy source called nectar. Some pollinators also use the pollen as a high- protein food. European honey bees are the most familiar species that humans domesticated thousands of years ago. 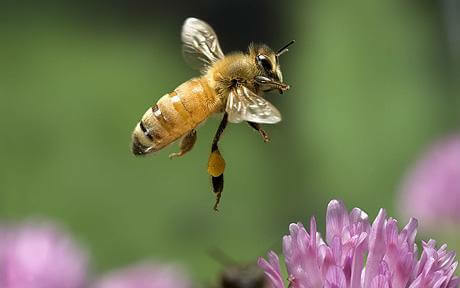 Humans have since moved the European honey bee all around the world to help pollinate orchards and crops. That means this species is an exotic, introduced and human-dependent species in much of its modern range. For instance, these bees were not native to North America and are only here because early colonists brought them. European honeybees are cusocial insects which is essentially a community ruled by one “queen” who lays all the eggs, a relatively small number of male drones whose only job is breeding with the queen and with unrelated virgin queens from other colonies. The rest of the hive is made up of functionally sterile, female, worker bees. The people who tend the bees are called beekeepers and they provide hives, which are typically wooden box homes where the bees can set up their honey combs and their stations for the queen’s eggs to develop. The beekeepers often transport these hives from place to place where farmers pay for the pollination services the bees provide. The beekeepers also harvest some of the honey the bees make from the plant nectar, and that is their other source of income. To keep the hives going when in transit or at times of year with no ready source of flowers, beekeepers might supplement the hive’s diet with an alternative sugar or protein source. Having an organized community, bees are able to help take care of each other. There is a division of labor in which some workers go out to gather pollen and nectar, others tend the eggs and young, while still others guard the hive from intruders and gather water to drink and with which to cool the hive. The members of the hive communicate with each other based on dances that code for various messages. So, the social aspect of bee biology is a plus for the species, but it can also have downsides. There are several different diseases and parasites that can spread through a hive much more easily than between insects that live solitary lives. There is a human element that plays into this. During certain times of the year, a huge number of the commercial hives are moved to the same region. This relocation of hives is a good opportunity for diseases and parasites to spread from hive to hive—kind of like STDs that are spread on Spring Break between college students. 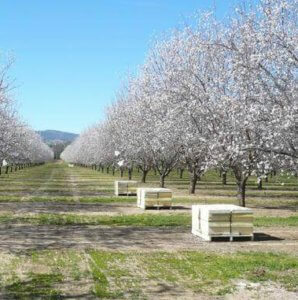 Around February in the U.S., approximately 85 percent of American bee hives are taken to California to help pollinate the more than a million acres of almonds grown there. 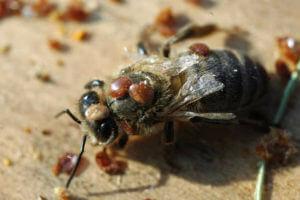 That becomes a great opportunity for the pests of the bees, particularly the varroa mite. This mite not only latches onto and draws fluids out of bees, it also vectors virus diseases. Most bee experts I’ve talked to think the varroa mite and the viruses it spreads are a much bigger issue for bees than insecticides or even other bee diseases. This might become less of an issue in the future because the almond industry is progressively planting new cultivars, or varieties, that are “self-fertile” so they don’t need bees for pollination, or at least half as many bees. Also, beekeepers have found that by bringing in some bumble bees, fewer hives are needed in each orchard. The interaction between different kinds of bees induces the honey bees to do more jumping back and forth between the rows of trees which are the different types needed for cross pollination. When that happens, fewer bees are needed to get the job done. There is another complication to the bee story. European honey bees transferred quite easily to new homes in North America, but they didn’t do well in Central and South America. In the 1950s, a Brazilian scientist named Warwick Kerr brought over a species of bee from Southern Africa that he hoped he could breed with the European bees, creating a type that would perform better in his region. He knew this new species was quite a bit more aggressive than the European bees. Yes, our European bees will sometimes sting us, but are usually not easily induced to do so. Kerr’s hope was to combine the adaptation for Southern Latitudes with relative safety. Unfortunately, some of those new bees escaped from where they were being studied and started to breed with the gentler bees and turn them into colonies of a much more dangerous character. These “Africanized” bees have since spread throughout South and Central America, even to the Southern reaches of the US. In 1974, there was a movie produced called The Swarm, a horror flick depicting huge swarms of Africanized bees attacking cities in Texas and elsewhere. Fortunately, that scenario has never played out in the real world and the threat from these more aggressive bees seems to have faded over time. There are a few more wrinkles in the bee story. Even when so many bees are taken to California to pollinate almonds, they can usually find various wild flowers growing in the surrounding hills. However, when there were severe drought years in California, the bees didn’t have as many flower options, and that lack of diversity in their diet wasn’t good for the health of the colonies. Also, in the heartland of the U.S. the really dominant crops like soybeans, corn and wheat are not really pollinator friendly. There are, however, a number of programs supported by botanical gardens, non-profit groups, and the crop protection industry to intentionally plant pollinator-friendly flowering plants along field borders and other suitable spots. You can listen to one of my earlier PopAgriculture podcasts to learn about Prairie Strips, which are intentional plantings of the original flora of that Tall Grass Prairie ecosystem that help stabilize soils to prevent erosion, capture fertilizers that could otherwise end up in the waterways and provide the sort of diverse habitat that is good for both our domesticated bees and other pollinator species. Now back to the issue of diseases. Most experts think the varroa mite and the viruses it spreads are the single biggest problem for bees. In regions where the beekeeping community has managed to prevent that pest from getting a foothold, bee populations have never experienced the kind of disruptions that have occurred elsewhere. There are other diseases that impact pollinators as well. One is a bacterial malady called foul brood, and the standard practice if a hive is infected is to burn it. Professional beekeepers bemoan the fact that many amateur beekeepers are unwilling to do something like that. In trying to be nice to their bees, experts say, they are actually endangering other bees in their neighborhood. So, in conclusion, there are lots of complex issues surrounding domesticated bees and wild species of pollinators, but there really is no looming bee apocalypse. If you want to learn more about bees, I’d suggest you visit Scientific Beekeeping, an expert blog written by biologist Randy Oliver. Randy was kind enough to review this podcast episode. Paying attention to the many issues facing bees and doing more research are clearly good ideas. So instead of ending up at “you never know” like Winnie The Pooh, we can take the right steps to protect our important little insect friends. Dr. Steve Savage is a plant pathologist and senior contributor to the GLP. Bio. Follow him on Twitter @grapedoc. The Pop Agriculture podcast is available for listening or subscription on iTunes and Google Podcasts. ‘Factory farming’ poisons our food and harms animals?